Google added another features to the client service called Drive File stream. 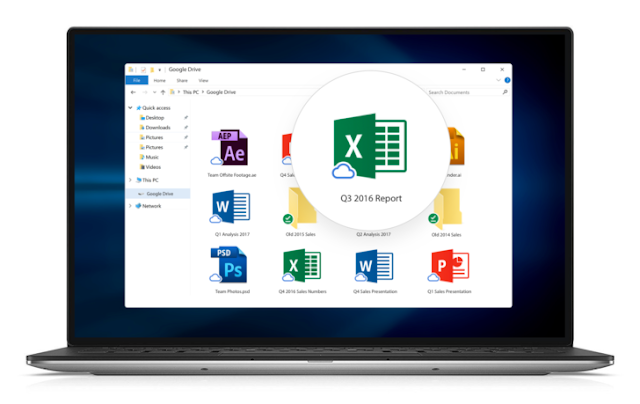 Google Drive Desktop is one of the service render by Google where you can upload stuffs like photos, video, document etc and also download whenever you need them back . But it seems not to be great on Windows when you want to have access to file, it has to be stored on your computer at all times. Recently last year Google added new File stream which adds all files to your computer but only downloads the data when you want to open something (similar to OneDrive on Windows 8). Unfortunately, Drive File Stream is only available to G Suite users, so us normal people can't try it out. If you do happen to have a G Suite account, File Stream just became much more useful. A new update, which started rolling out on February 23 (yesterday), adds the ability to move the file cache to any directory (on drives using NTFS, APFS, or HFS+). So if you are running out of space, you can easily move the cache folder to an external or network drive. Other new features include upload/download speed limits, performance improvements, and the ability to pause file syncing. Now, who do I have to bribe at Google to let Gmail accounts access this?